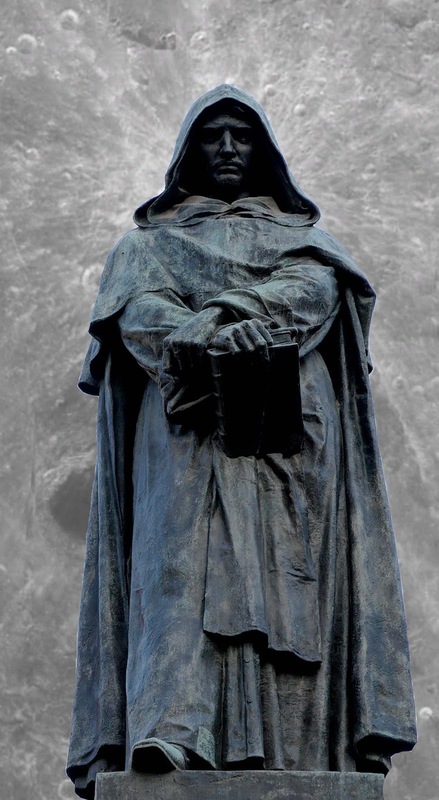 Why did they burn Giordano Bruno? Because the open mind is dangerous. Because the power of the word is a weapon. Because the freedom of life is might. against which the violence of power is futile. for anyone who lives within their servitude. and Copernicus expands the world. bursts the bonds of slavery. Therefore, they burned Giordano Bruno. towering against Giordano Bruno's thought. Therefore, not they, but he lives. Piet Hein was a Danish scientist, architect, polymath, universalist, poet, and friend of Neils Bohr. Giordano Bruno was 16th century Italian philosopher, mathematician, and astronomer, who wandered through the intellectual centers of Europe, teaching, learning, disseminating his ideas, which ran contrary to the dominant religious power structure. Some of his writing seems prophetic of contemporary cosmological thought. "In 1584, twenty-five years before Galileo lifted a telescope, Bruno took the Copernican hypothesis to the outrageous new conclusion that the sun is merely one of an infinity of stars, which stretch across boundless and inexhaustible space." Did Galileo recant because he knew what had happened to Bruno? It must have gone through his mind. Of course, you must know of what Galileo is said to have uttered as he was being led from the dungeons, "Eppur si move", that is, still it moves. Is that why he had to subsequently endure house arrest? This wikipedia article seems fair. Galileo was found "vehemently suspect of heresy," namely of having held the opinions that the Sun lies motionless at the center of the universe, that the Earth is not at its centre and moves, and that one may hold and defend an opinion as probable after it has been declared contrary to Holy Scripture. He was required to "abjure, curse, and detest" those opinions.